Wyoming has a proud legacy of service in our Armed Forces, sometimes that service comes at a great cost. Since the start of the Global War on Terror, Wyoming has lost sons and daughters as they protected our freedom and liberty. 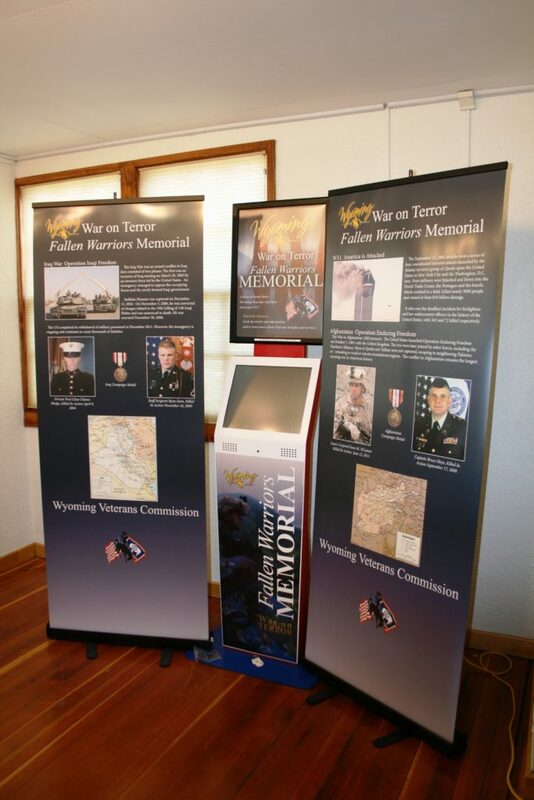 To honor their memory and legacy of service, the Wyoming Veterans Commission created several Fallen Warrior Kiosks. Each kiosk contains biographies, pictures, and stories about these fallen heroes. For the last several years, they have been traveling throughout Wyoming. The Wyoming Military Department is scheduling host locations for their Fallen Warrior Kiosks for 2019-2021. There is no cost for hosting. Each venue will host the kiosk for three months. The units have a small footprint, requiring only 10 square feet of space with access to an electrical outlet. The Wyoming Veterans Commission will assist with moving kiosks between venues, provide operational training, and provide media resources to help advertise the kiosk. To host one of the Fallen Warrior Kiosks fill out the form in the application packet and send it to Wyoming Military Department Museums, 3740 Jourgensen Ave., Casper, WY 82604. The deadline is January 25, 2019. Questions may go to John Woodward at john.woodward@wyo.gov or (307) 473-3489.